Turtle Clean™ 50 External Canister Filter | Zoo Med Laboratories, Inc. External canister filter for turtle tanks, vivariums, Box Turtle pools, or Turtle Tubs up to 50 gallons. External canister filter for turtle habitats up to 50 gallons (190 liters) in size. 200 gallon per hour (gph) rating. Slimline design fits in tight spaces. Double filtering system with internal biological recirculation. Combines mechanical, biological, and chemical filtration. included spray bar to increase oxygenation. 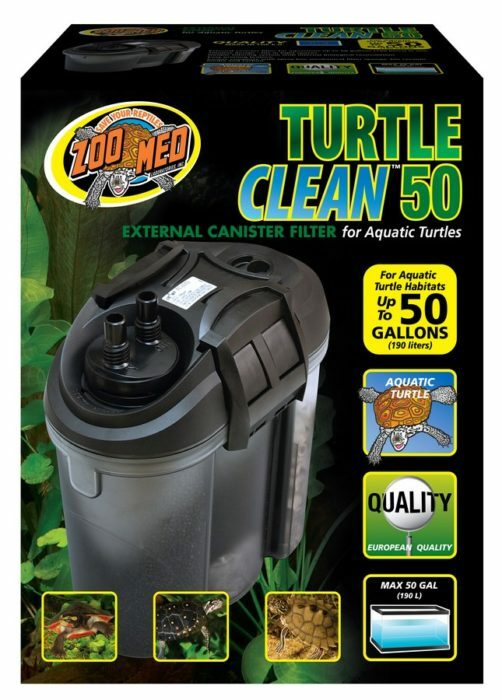 Zoo Med’s Turtle Clean™ 50 is the perfect filtration system for Aquatic turtle tanks up to 50 gallons. Here’s Ashley to help you set it up. Q: Does the Carbon bag go above or below the ceramic media in the filter chamber? A: The carbon bag should go below the center sponge. Q: How often should I change the carbon? A: The carbon should be replaced once a month. Q: How often should I change the ceramic media? A: The ceramic media should only be changed if it is restricting water flow. Q: How often should I change the sponge(s)? A: The sponge(s) can be rinsed monthly but only need to be changed if they cannot be cleaned or if they start to break down. Q: How do I prime this filter? A: Be sure that the canister is completely full of water and that the fill cap is in place before plugging the filter in. Q: What is the ceramic media for? A: The ceramic media provides surface area for beneficial bacteria to grow. This bacteria will help trap other bacteria and break down waste trapped in the filter. Q: How often should I clean my filter? A: Once monthly is usually sufficient for one turtle. If you have more animals, it may be necessary to clean it more often. Q: What are the dimensions of the included tubing and hoses? A: The 2 tubes are 11.75″ long, with a diameter of 5/8″; the 2 hoses are 4′ long with a diameter of 3/4″.